Paper • ISBN-13: 9781560256915 • US $15.95 • 8.3 in x 5.5 in • 313 pgs. Before John Sayles was an Oscar-nominated screenwriter, he was a National Book Award-nominated writer of fiction. 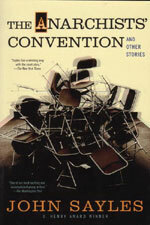 The Anarchists’ Convention is Sayles’s first, celebrated short story collection, and includes the widely anthologized, O. Henry award-winning “I-80 Nebraska.” Infused with humor and compassion, diverse in scene and character, each narrative captures the idioms and matter-of-fact strength of the homeless, restless, and eternally hopeful. These American originals range from a kid on the road headed westward; a lonely woman temping in Boston; anthropologists in the field; bums on the beach; and speed-addled truckers gabbing over the CB radio — and of course the anarchists of the title, ancient septuagenarian political die-hards who find strength for a noble last stand.